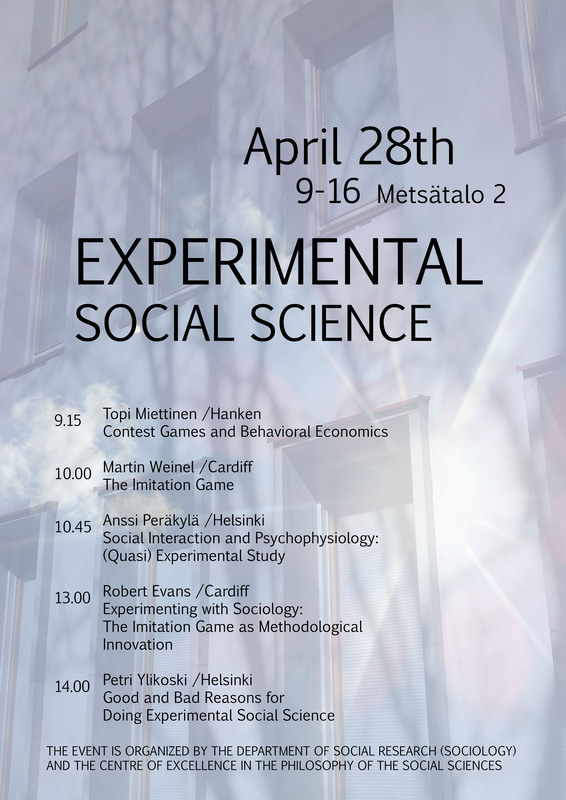 On Monday 28 April Rob Evans and Martin Weinel were in Helsinki at the Experimental Social Science workshop organised by Professor Petri Ylikoski of Helsinki University. The workshop explored the different ways in which experimental approaches are being used within the social sciences. This diversity was nicely illustrated by the three presentations that made up the morning session. All three reported on empiricial research and all three described quite different projects. 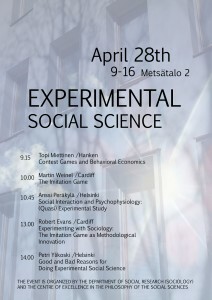 Topi Miettinen described the use of experiments in behavioural economics to explore the relationship between social values and economic decision-making; Martin Weinel outlined the Imitation Game method and some of the main findings from our current project; and Anssi Peräkylä reported on two published studies in which conversation analysis was combined with physiological measurements in order to examine the relationship between the affective and linguistic elements of story telling. In his talk Petri Ylikoski took a similar tack. Focussing on the rise of evidence based policy and practice, he argued that the evidence hierarchy that typically characterises such approaches may be counter-productive in the long-run. His argument was that setting one particular research design — typically the randomised control trial — as the gold standard for social science research may prove counter-productive in the long-run as the effect is to devalue other forms of research design and evidence. In other words, by taking too narrow a view of what counts as evidence, the evidence-based policy movement may find itself working with less evidence — and less reliable evidence at that — than would otherwise be the case.